Giorgio Morandi, Still Life, 1953. Oil on canvas, 8 x 15 7/8 in. (20.3 x 40.3 cm). The Phillips Collection, Washington, D.C., Acquired 1954. Read part one and part two in this series. 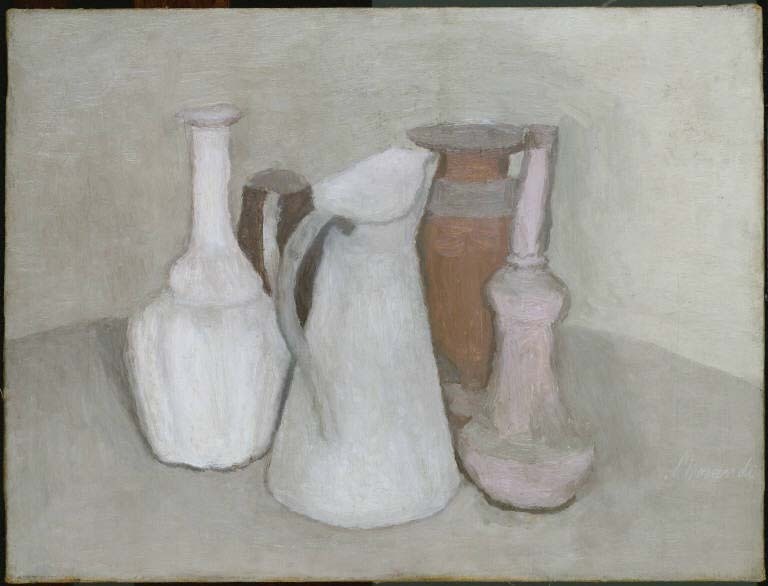 Lastly, the native Italian Giorgio Morandi, born in Bologna in 1890, studied at the Accademia di Belle Arti of Bologna where he trained in the classical Italian and Flemish styles of painting. During his last years there, his style began to change, having been briefly influenced by futurism and other modern trends. The arrangements of objects seen in Still Life, 1953 (shown above) and Still Life, 1950 (shown below) reflect his mature style. His earthy and subdued palette corresponds in tone to the Prendergast piece, which draws a connection between the oldest and the newest work on display here, highlighting the continual influence Italy exerted on these artists who depicted its beauty. 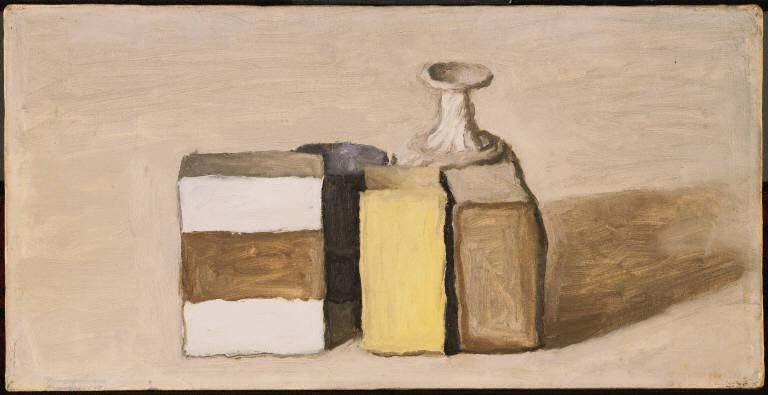 Giorgio Morandi, Still Life, 1950. Oil on canvas, 14 1/8 x 18 5/8 in. (35.9 x 47.3 cm). The Phillips Collection, Washington, D.C., Acquired 1957. Read part one in this series. Joseph Stella, Vesuvius, c. 1915-20. Watercolor and pencil on paper, 9 1/2 x 13 1/4 in. (24.1 x 33.7 cm). The Phillips Collection, Washington, D.C., Gift of Jennifer and Alan Pensler in memory of Leslie Pensler, 1997. Born near Naples, Italy in 1877, the artist Joseph Stella moved to the United States at the age of 18 where he began a career in medicine before attending the Art Students League in New York to study painting. He traveled to Paris in 1909, was inspired by cubism and futurism, and later participated in the Armory Show of 1913. 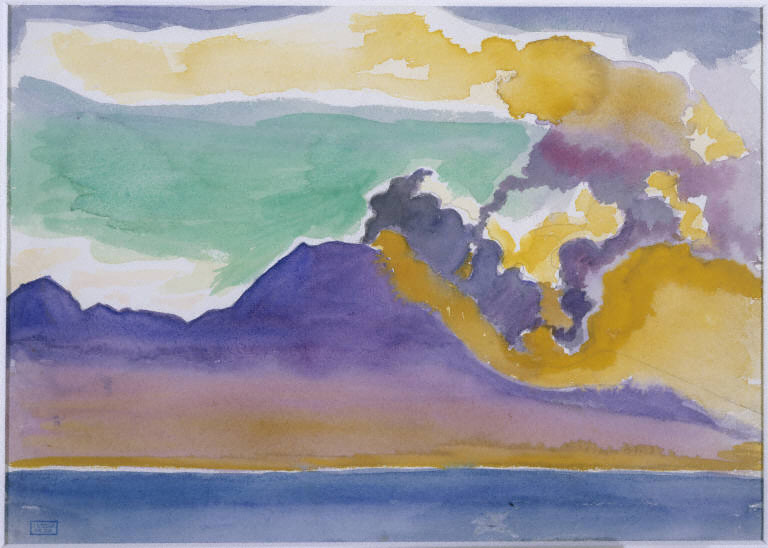 He continued to experiment with styles, the result of which can be seen in the vibrant colors of his watercolor Vesuvius from between 1920 and 1940, shown above. Italian Landscape, also from this time period, shows softer colors and more subtle references to modern techniques. While born to Italian parents, Giorgio de Chirico grew up in Volos, Greece, and studied art in Athens, Italy, and Germany. As an adult, de Chirico lived in many cities throughout Italy, each leaving its mark on his work. 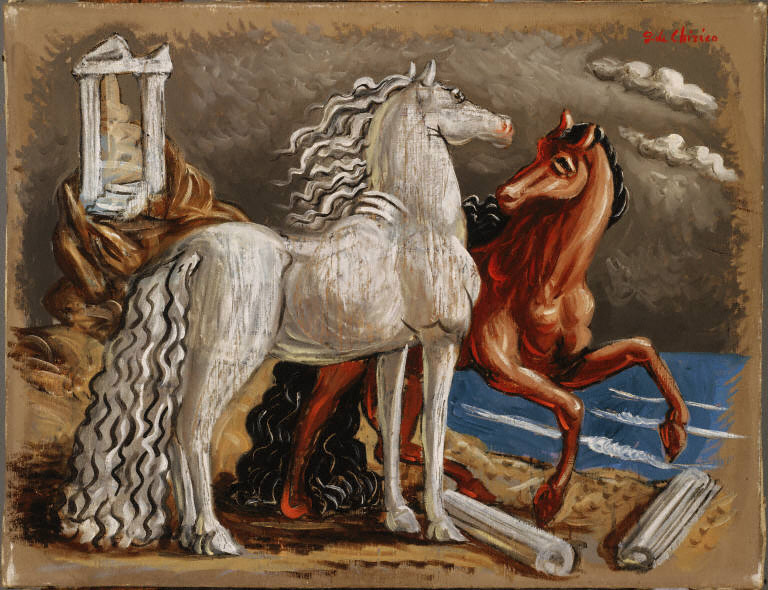 The painting seen below, Horses (1928), depicts two horses on a beach standing before a Roman architectural structure that refers to the legacy of Italian culture. Giorgio de Chirico, Horses, c. 1928. Oil on canvas, 19 3/4 x 25 5/8 in. (50.2 x 65 cm). The Phillips Collection, Washington, D.C., Acquired 1929. New installation of works inspired by Italy in an upstairs gallery in the house. Photo: Joshua Navarro. From the ancient Romans to the Renaissance, Italy has attracted and inspired artists from around the world for centuries. Many considered their artistic training incomplete without a trip to study from the great masters and to record the beautiful surrounding landscapes of Italy. The styles of art created and employed were just as diverse as the nationalities of the artists that Italy inspired. In a new permanent collection installation in the house, artists both Italian and foreign from the late 19th to the mid-20th century use the common thread of Italian inspiration to interpret landscapes and still life themes that reflect their unique visual vocabulary. This week, I will explore the foreign artists attracted to the beauty of Italy that are represented in the gallery. Maurice Prendergast, Pincian Hill, Rome, 1898. Watercolor over graphite pencil underdrawing on thick, medium-textured, off-white watercolor paper, 21 x 27 in. (53.3 x 68.6 cm). The Phillips Collection, Washington, D.C., Acquired 1920. Maurice Prendergast and John D. Graham were two such examples of painters drawn to Italy for its beautiful landscapes. 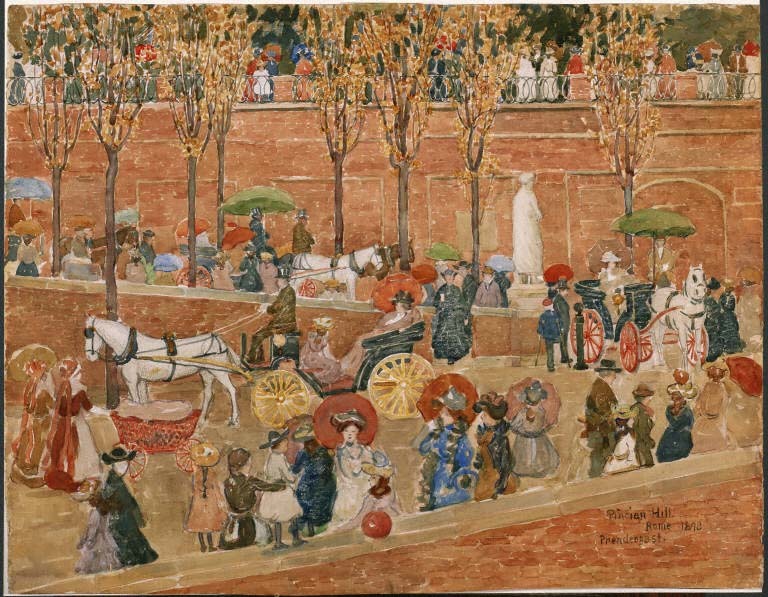 Prendergast, an American born in Newfoundland in 1858 and raised in Boston, studied painting in Britain and Paris before making his grand tour through Italy. In 1898, he traveled to Florence, Siena, Rome, Capri, and Venice, taking in the sights and colors. Pincian Hill, Rome (1898), created on this trip and shown above, shows a street view of Rome depicting not only Italian scenery, but also daily life. Graham similarly came upon his Italian source of inspiration by way of travel. Born in Ukraine in 1886, Graham escaped Bolshevik imprisonment and immigrated to the United States in 1920. After moving to America, he visited Asia, Africa, and Western Europe. 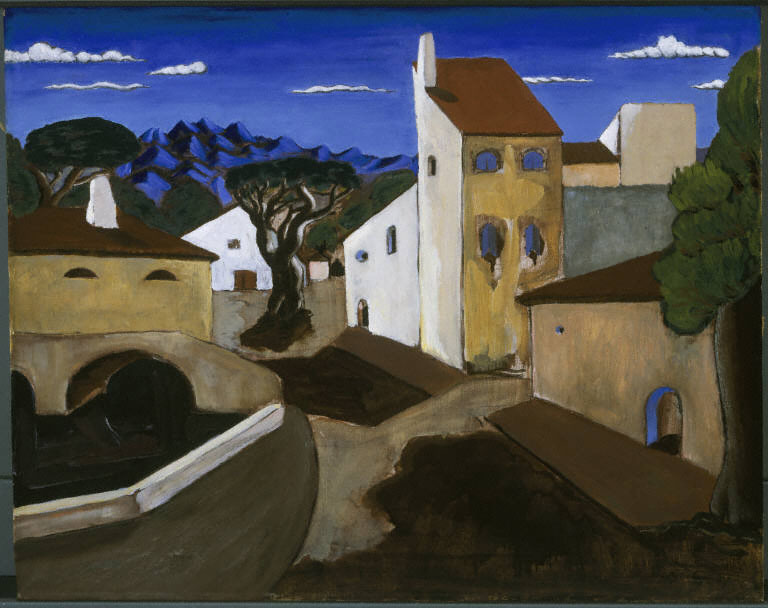 His works Mountain Village (1927), seen below, and Palermo (1928) depict beautiful Italian landscapes defined by vivid colors and geometric forms. Tomorrow, I’ll discuss works by Joseph Stella and Giorgio De Chirico. John Graham, Mountain Village, 1927. Oil on canvas, 16 x 20 in. (40.6 x 50.8 cm). 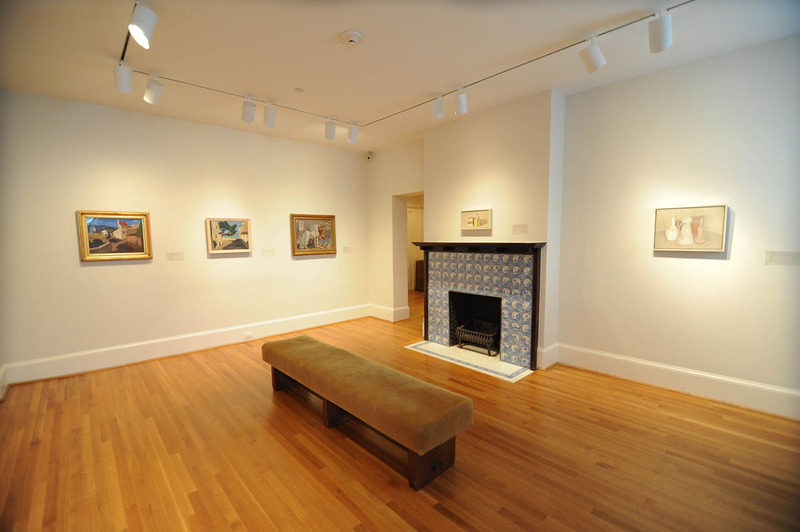 The Phillips Collection, Washington, D.C., Acquired by 1929, possibly 1927.